POLITICAL ROYALTY WITH A ROYAL PAIN | South Charlotte Newcomers! This long time Charlottean swoons with appropriate southnerness when receiving a gift certificate for a day at the Ballantyne Spa. Sitting in the massage chair with my feet contentedly immersed in bubbles, looking out over the beautiful PGA golf course and watching with disbelief as golfers DELIGHTFULLY brave the 98 degree heat to play the 18th hole is one of the many pleasures of living in South Charlotte. Late August has the Spa abuzz with the expectation of political “dignitaries” staying at the hotel and lodge during the DNC. Indeed, the presence of uniformed police and very “secret service” looking people seem to be all about the complex. It is being said that President Barack Obama and First Lady Michelle Obama are coming to our beautiful south side during the DNC. No doubt the estimated 35,000 people, hundreds of news media and the President himself descending on Charlotte for the 2012 DNC will be impressed with our beautiful city and our especially beauteous south side, but what about our traffic? We are, of course, extending our Southern hospitality to the dignitaries, and our manners certainly extend to our traffic. No cacophony of car horns blaring in our fine city. But, we do have our fair share of congestion and we do expect the usual I-485 traffic jams as we make our way from the burbs to center city. The more than 35,000 people added to the population will create a traffic nightmare for locals. Traffic delays, detours and road closures have our many uptown banks and corporations telling employees to work from home and avoid the city altogether. Great solution! Except for South Charlotte, specifically Ballantyne, will now have the headache and pain of traffic delays, detours and road closures. What’s a suburb working girl to do? Be prepared! Smile and do a southern waltz through that darn nasty commute. We love our visitors and are honored to be hosting the DNC. Here is the latest to prepare South Charlotteans for September 3rd-7th. between Johnston Road and North Community House Road all day Monday and Tuesday, except for commercial motor vehicles. • School Buses and CATS buses are excluded from the above restriction. • Residents and guests only of Camden Ballantyne will be allowed limited vehicular access to/from their community throughout the week via Summit Commons Blvd (East Gate Only) from westbound Ballantyne Commons Parkway. Access from eastbound Ballantyne Commons Parkway is unrestricted until approximately 9:00a.m. on Wednesday, September 5. 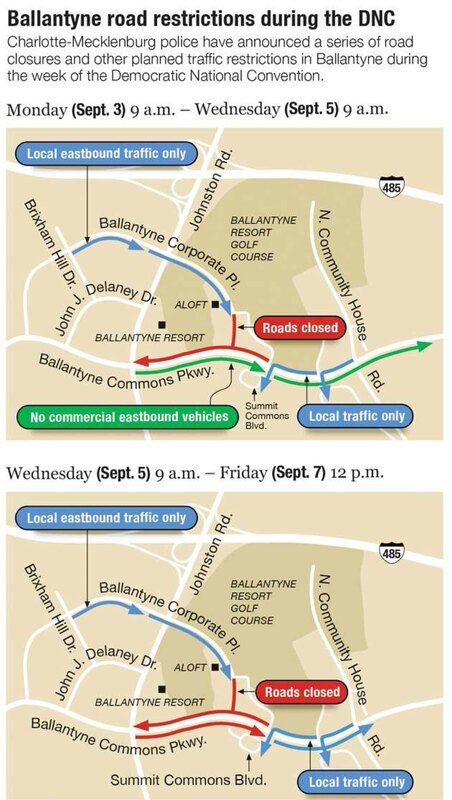 • Residents and guests only of Ballantyne Country Club will be allowed limited vehicular access to/from their community throughout the week via Ballantyne Forest Drive accessed from westbound Ballantyne Commons Parkway. Access from eastbound Ballantyne Commons Parkway is unrestricted until approximately 9:00 a.m. on Wednesday, September 5. • Tenants and guests only of Ballantyne Corporate Park Harris and Premier Buildings, the Aloft Hotel, and Dana Radar Golf School will be allowed limited vehicular access to their respective parking lots from eastbound Ballantyne Corporate Place. • Tenants and guests only of 13777 Ballantyne Corporate Place (Office Building), 13520 and 13510 Ballantyne Corporate Place (Bank of America Offices), 13515 Ballantyne Corporate Place (SPX Offices), 13320 Ballantyne Corporate Place (Balfour Beatty Construction Site) will be allowed limited vehicular access to their respective parking lots from eastbound Ballantyne Corporate Place. 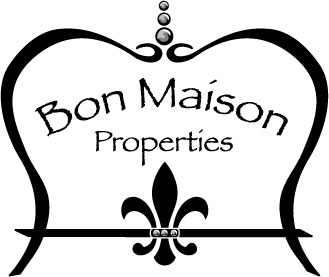 • Ballantyne Hotel guests, visitors, and employees should access the hotel from Johnston Road beginning at approximately 9:00 a.m. on Monday, September 3, 2012, ending on Friday, September 7 at approximately 12:00 p.m.